To continue with the bag making basics that I started here. After understanding the basic terminology of sewing bags,I guess its time to understand the different kind of needles. YES.............there are different needles for different purposes,fabric & so on.You can not use a general purpose needle in purse making like you can while sewing clothing! Ok.............so now that I have convinced you, you need different types of needles lemme tell you what types are they. Firstly you need to know that the needles have different numbers,same as all other needles like knitting or crochet.Sewing needles too follow US & European numbering system.In India we follow US numbering system.Whichever system you use you should know that smaller the number of the needle, the smaller(thinner) the needle. This remains true, irrespective of the numbering system. These are the most important things you need to know about a needle.This is how the base end which is inserted in the machine looks like. When I started sewing leather bags,I got this really thick (no 23) needle & it had a rounded shank as opposed to a flat shank which we generally use.I was completely bummed as to how to go ahead!!!! I went to my local bag making shop & he explained to me how the insert the round shanked needle in the machine.You see the dent just above the rounded shaft???? Now to numbering of the needles. You can use the thinner ones or the ones with lower number with finer fabrics,if you use it on a heavier fabric,it may bend or worse break!!! You can buy a few numbers you use frequently in bulk. Now lets move on to deciphering the mumbo jumbo written on the pack of needles!! here is a pic of 2 packs lying right in front of me. The first thing you see on both the packs is the description of type of needles. On the first pack DB* 1,16* 231/237,1738 is referring to thick needle used for high speed sewing machines.It has a circular shank & 2 dents on the shaft of the needle,one near the shank & another near the eye of the needle.These details may vary from manufacturer to manufacturer though. The first pack is US 23 & European 160 which is like really thick & I use it for my leather bags where I have to sew through multiple layers!! The second pack is size 16 US & 100 European.Did you notice one has US no.first & another has European no.first????? It doesn't make a darn difference as long as you understood the basic type of needle!!!!! Don't fret in case you lose the needle cover or you misplace the needle in another case ,the numbers are written on individual needle too ,so just check it before using it:) And with time you will be able to tell which needle goes with what fabric by just the feel of the needle,you wouldn't need to read the number! This much of info is pretty sufficient for a beginner,but of course if you are a real keen learner then here are the different classifications of types of needles.Taken from Wikipedia. Ballpoints have a rounded point and are used for knitted fabrics. Sizes 5-10. Beading needles are very fine, with a narrow eye to enable it to fit through the center of beads and sequins. They are usually long so that a number of beads can be threaded at a time. Sizes 10-15. Bodkin. This is a long, thick needle with a ballpoint end and a large, elongated eye. They can be flat or round and are generally used for threading elastic, ribbon or tape through casings and lace openings. Darning needles have a blunt tip and large eye, similar to tapestry needles, but are longer, with yarn darners being the heaviest with very large eyes to thread yarn. Various types, with sizes ranging from 1-18. Doll needles are long and thin and are used for soft sculpturing on dolls, particularly facial details. Size 2.5"-7" long. Leather needles, also known as Glovers needles, have a triangular point for piercing the leather without tearing it. Used on leather, suede, vinyl and plastic. Also known as wedge needle, this may also describe the shape. Sizes 3/0-10. 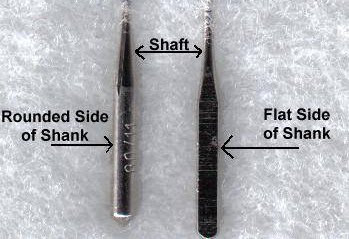 Sailmaker needles are similar to leather needles, but the triangular point extends further up the shaft. Used for sewing thick canvas or heavy leather. Spiral Eye Side Threading needles come in a variety of sizes and types. The precision cut and the geometry of the eye allows for most material to slide over the opening on the side. Good for those with low vision or dexterity issues. Tapestry needles have a large eye and a blunt tip. They are used for working on embroidery canvas, even-weave material and other loosely woven fabrics. The blunt tip allow the needle to pass through the fabric without damaging it. Double ended tapestry needles, with the eye in the middle, are also available for the convenience of embroiderers who work with fabric mounted in a frame. 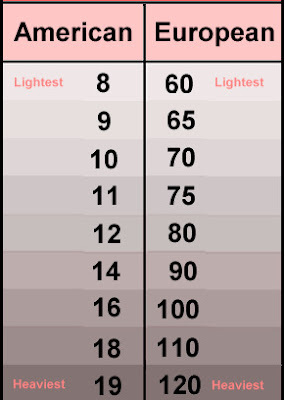 Sizes from 13 (heaviest) to 28 (finest). Tatting needles are long and are the same thickness for their entire length, including at the eye, to enable thread to be pulled through the double stitches used in tatting. Upholstery needles are heavy, long needles that can be straight or curved. Used for sewing heavy fabrics, upholstery work, tufting and for tying quilts. Curved needles are used for difficult situations where a straight needle is not practical and are also used in fabric box-making. Heavy duty 12" needles are used for repairing mattresses. Straight sizes: 3"-12" long, curved: 1.5"-6" long.